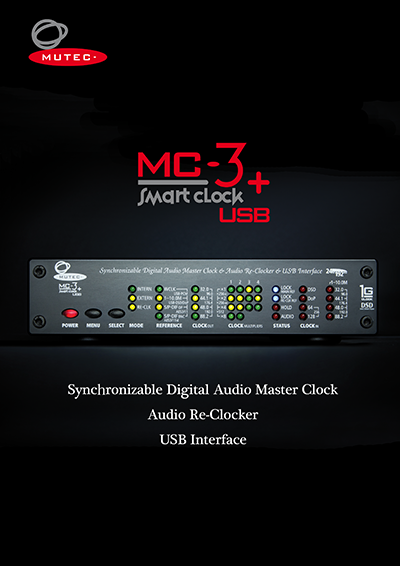 The MC-3+ Smart Clock USB is setting a new benchmark for clocking technology and the reproduction of digital audio by uniquely combining an audiophile USB interface with an audio re-clocker in perfection! Particularly designed for the demands of high-end consumer audio, the device expands a new sonic universe with increased musicality, clarity, and precision. As such, the MC-3+USB will prove its worth in many audiophile listening rooms around the world. Eliminates so-called digital "clicks and pops"
USB interfaces are the most commonly utilized devices for digital audio transmission in a computer-based music playback environment. But the convenience and ease of use often times come at a price of lackluster audio quality to the critical ears of high-end consumer audio aficionados and of professional users. It’s no secret that even the best D/A converters are not capable of reproducing and converting audio via USB at the highest possible level, which is why using digital audio inputs such as AES3 or S/P-DIF yields significantly better results and is generally preferred. We have invested into our own research to uncover the underlying principles and the root of the problem with high-end audio via USB. In a nutshell, electromagnetic interference of any kind, but particularly those caused by audio computers and other IT devices, will induce noise and seriously disturb the audio transmission. In order to eliminate these disturbances and avoid their damaging effect on the conversion process as much as possible we have developed a new signal-isolating, asynchronous USB interface for the MC-3+ Smart Clock USB. It has been designed as a dedicated building block with a power supply that’s independent from the main board of the unit. In addition, the USB interface is galvanically isolated from the other parts of the circuitry and employs its own ultra-low noise audio oscillators that once again are autonomous and isolated from the other processes. 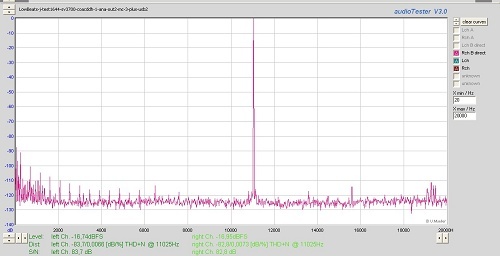 In combination with IT-based high-speed isolators we have achieved exceptional reduction of the impact of noise interference within the USB data stream yielding a USB interface that’s virtually immune to any interference problems caused by PCs, laptops or music servers. At the same time, there are no limitations regarding the possible clock rates for playback from your music library with the MC-3+USB supporting all rates possible up to high-speed USB as well as DSD/DoP streams up to DSD/DoP256. All of these features in combination with the subsequent re-clocking process, proprietary to MUTEC, leads to a significant acoustic improvement of connected digital audio devices that usually manifests itself in increased width of the sound stage, more precise imaging, and with a more musical representation of the recorded space and the instruments within it. Stock consumer audio devices, laptops, and audio computers can now achieve a new level of sonic perfection that was previously reserved for equipment with much higher price tags. The MC-3+ Smart Clock USB enables bi-directional audio format conversion (half-duplex) between USB audio streams, AES3, AES3id, and S/P-DIF signals. In addition to a variety of digital audio outputs like most other competing devices, it furthermore also provides a full set of digital inputs for AES3, AES3id, and S/P-DIF signals with BNC, RCA, and optical connectivity. Audio streams received via USB will always be converted to five audio outputs allowing multiple devices to receive the same audio simultaneously. Upon selecting one of the audio inputs, the signal will be converted into a USB audio stream to be sent to the computer. At the same time, the source signal will also be converted to the digital outputs of the MC-3+USB, which can be used for monitoring purposes or a digital peak meter, while audio is recorded in the computer via USB. The re-clocking process takes care of delivering your audio at the utmost precision in both cases. 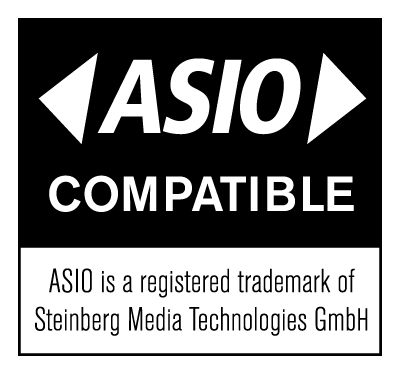 Apart from transmitting standard PCM audio the USB interface is further capable of receiving native DSD and DoP streams with up to four times the SACD clock rate (DSD256). These streams will be re-clocked and converted to PCM audio by the MC-3+USB in realtime to pass them on to the five audio outputs simultaneously. 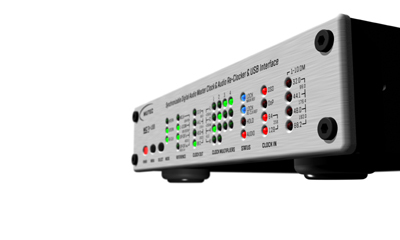 The desired clock rate for the digital outputs can be selected on the front panel with options between 44.1 kHz, 88.2 kHzand 176.4 kHzthat are independent from the clock rate of the incoming DSD or DoP streams. 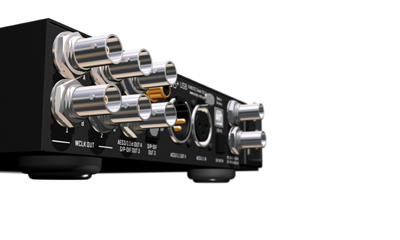 High-end D/A converters or premium music servers often provide BNC connectors for the transmission of S/P-DIF signals, which are the best choice due to their superior electrical properties compared to the RCA connector. 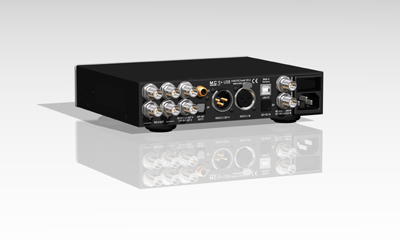 With the MC-3+USB you can conveniently convert USB-PCM, DSD/DoP, or AES3 streams to the S/P-DIF format and send it to appropriately equipped high-end receivers via BNC. 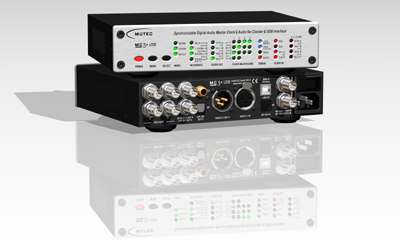 Four additional outputs in other formats may be used simultaneously to drive digital headphone amps or other digital audio devices for recording and/or monitoring. 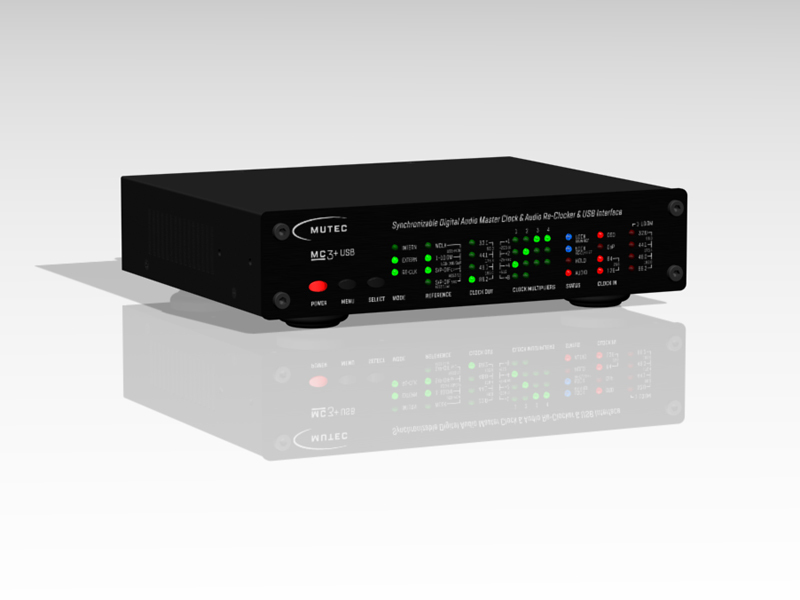 While the MC-3+USB is playing back your precious music via the digital audio outputs, the four Word Clock outputs simultaneously provide phase-coherent clock signals. Since those are derived from the internal re-clocking process they have the same ultra-low jitter qualities as the basic clock signal embedded in the audio signals. 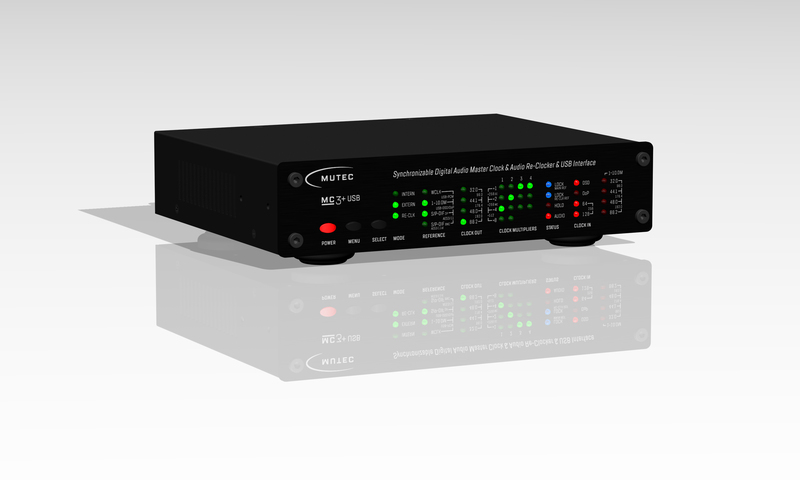 Furthermore, the clock outputs may be independently switched in pairs to scale to clock rates of up to FS1 x 512, coming out to 22.5792 MHz or 24.576 MHz respectively making the Word Clock signals of MC-3+USB are ideally suited to clock a wide range of studio equipment and high-end DACs, CD players, and audio interfaces from manufacturers such as Esoteric, TACT Audio or M2Tech (e.g. hiFace Evo). It is widely known that a master clock improves the sound quality of digital audio devices such as CD players and music streamers or mixing desks and DAWs more or less. But carving out finest details in audio recordings to reproduce individual instruments as clearly and with the best spatial resolution as possible is best achieved with high-resolution re-clocking of the audio material. This is what MUTEC’s proprietary re-clocking algorithm paired with the 1G-Clock technology provides at the highest level! Our MC-3+ Smart Clock already impressed critics and users around the world, and the MC-3+USB now marks the next generation of re-clocking by MUTEC. Extreme oversampling of incoming data allows the audio to be recombined and merged with a newly generated ultra-low jitter clock signal at ultimate precision, enhancing the re-clocked audio with unparalleled richness of details, spatiality, and musicality. 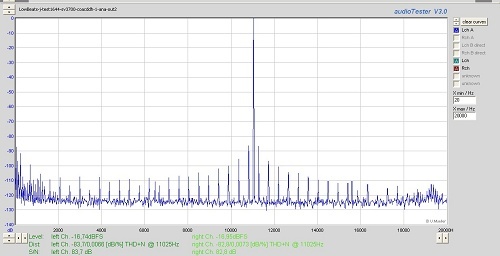 Jitter spectrum of a DAC’s analogue output while locked to a jittery source, the professional DAT recorder SV-3700 of Panasonic. Same configuration as first diagram, but with MC-3+USB within the signal path between the DAT recorder and the DAC. If desired this effect can be further heightened by utilizing the unique externally referenced re-clocking mode of the MC-3+USB that locks to Rubidium- or Cesium-based atomic clocks and GPS receivers (1-10 MHz). Presuming an extremely high-grade external reference, it is possible to perfect the audiophile quality and precision of the audio clock beyond the already stellar internal re-clocking algorithms of the device. The flexible, audiophile re-clocking of the MC-3+USB makes it ideally suited to regenerate music recordings from jitter-affected digital sources and to optimize it for further processing, archival or simply for your listening pleasure at the best possible quality. The world-renowned 1G-Clock technology that we introduced with the popular MC-3+ Smart Clock by MUTEC has been setting new standards for the generation of nearly jitter-free clock signals. 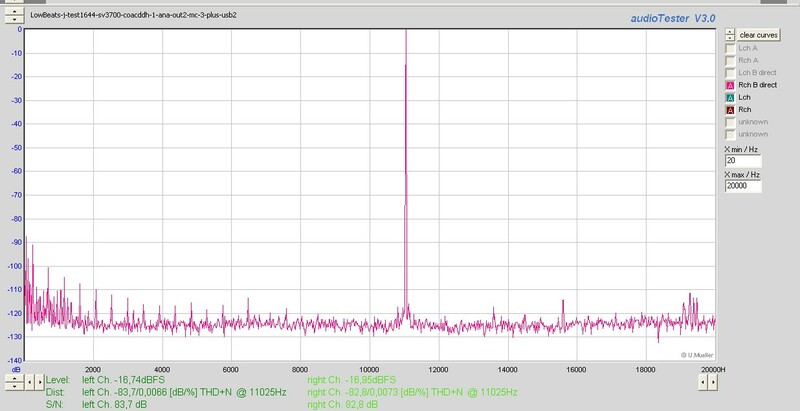 Our engineers have derived a reference clock rate for our DDS (direct digital synthesis) process through extensive lab testing, which reduces jitter and noise artifacts present in all other DDS algorithms to their absolute minimum. Building on these fundamentals, we were able to further improve clocking algorithms in the MC-3+USB based on our 1G-Clock technology. The reduction of power supply noise has been taken to yet another level by employing the latest cutting-edge components. All of these measures combined yield an additional, clearly audible improvement in transparency, spatiality, and musicality of the re-clocked audio as our distinguished beta-testers can attest. The new MC-3+ Smart Clock USB serves not only as a generator, but also as a clock distributor. Unlike other products, the MC-3+USB effectively regenerates incoming clock signals to higher precision as the signal source. This helps to stabilize existing clock systems and improves the level of sound reproduction quality in the studio environment. In cases when the MC-3+USB’s digitally compensated clock accuracy is not sufficient, it is possible to lock the system to so-called atomic clocks or GPS receivers, raising the timing accuracy to the highest possible level. 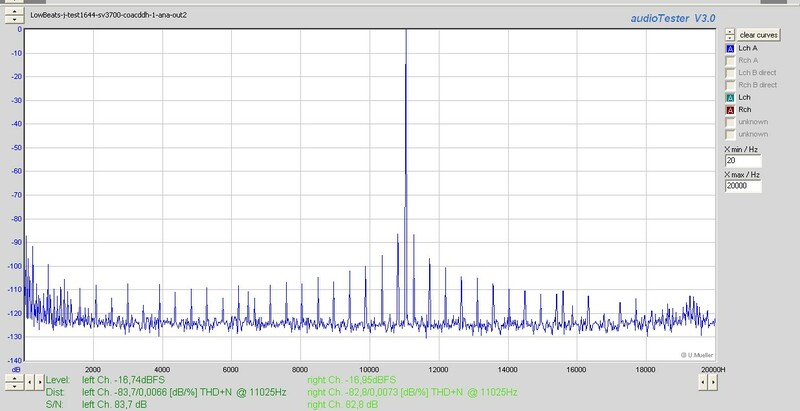 In addition to the commonly known 10 MHz frequency of Rubidium-based clocks and GPS receivers, the device also supports 5 MHz Caesium-based clock rates as well as 1 MHz and 2.5 MHz frequencies. "Does this sound familiar? An inner voice telling you that this is exactly how things are supposed to sound? It's like a locking in place. At the end of the day it's not about sampling rates, bit depths, cable qualities or lengths, or the number of LEDs on the front panel. What counts is the music - the emotional experience and the capabilities of the listening chain to take a step back. MUTEC's MC‑3+ Smart Clock USB gets me closer to the core of the music and allows it to shine at its best. That translates into a huge compliment and a strong recommendation from my part. Let's not fool ourselves: the future and even the present will be digital. It's about time those bits get recomposed properly. And don't trust those marketeers, trust your own ears!" 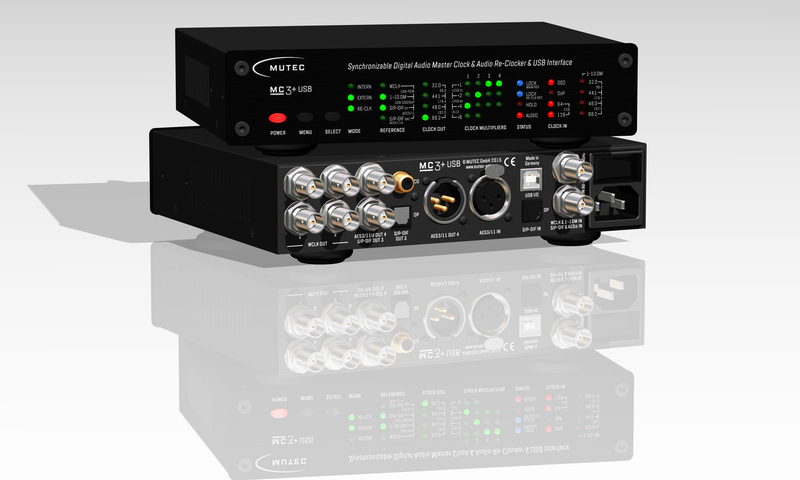 "Over all I found that the MUTEC MC‑3+USB supercharged my playback very nicely. It makes a great converter sound even better." "I have tried various programs to convert DSD to 176.4kHz or 88.2kHz 24-bit files [...], but somehow such conversions don’t sound as convincing as those processed through the MUTEC. Put simply, this little unit gives the sound more punch, more conviction and less ‘grain’, revealing more detail and ambience, better slam in the bass, finer textures in bass strings and drums, and just that bit more character on voices and lead instruments. What’s more, trying it with a variety of DACs able to take USB input reveals that even with 16-bit/ 44.1kHz CD-quality files (not to mention higher- sampling-and-bit-rate PC content), it manages the same trick of making the music sound more natural and less mechanical." "After my Musical Fidelity V link 192/96 stopped working, I was looking for an alternative DDC for USB to S/P-DIF conversion and found immediately the MUTEC MC‑3+USB due to lots of positive web discussions about this unit. With integration of the MC‑3+USB into my HiFi system, I must state that the overall sound quality has improved more than clearly! The timing is much more precise and the rhythm section of the songs gets more punch. Also the spatiality and separation of the individual instruments increases in depth and width considerably. Listening to my music is simply pure fun now. Very positive were also my experiences with MUTEC’s customer support. Having a technical question, I got feedback in a short time with a detailed statement from Mr. Peters. Thanks much for everything!" "The tonal improvement through the MUTEC MC‑3+USB was at once clearly noticeable without longer listening sessions. Although my set-up sounded very well already, the acoustic characteristics changed immediately to much more spatiality, voices and instruments now sound more sophisticated and the depth of the whole sound-stage has enlarged enormous. I never thought that the changes in sound will be so considerably audible. That's amazing!" 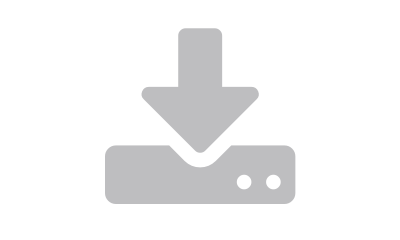 "It appears the V1.10 firmware update enhances the sound quality and makes using DSD to PCM playback better. 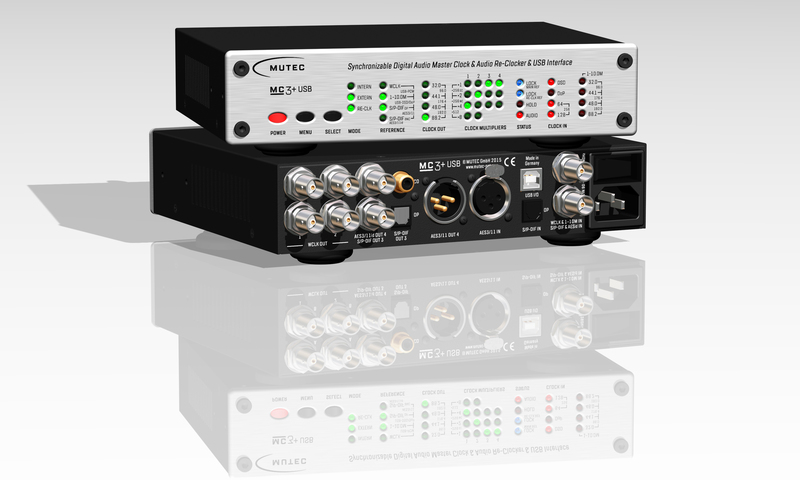 Audirvana Plus usually does the conversion for non-DSD enabled DAC's and the method the MUTEC unit now implements is superior to that of the software. Thank you for sending the update. Much appreciated!" 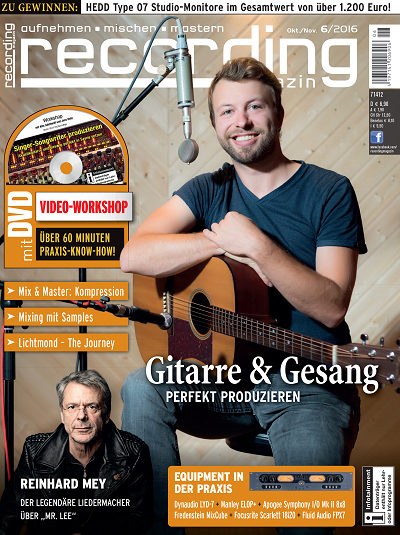 "My high end AES/EBU cable arrived on the same day as my MC‑3+USB, so I plugged it in and within the first fifteen seconds (no kidding) I smiled with delight, realizing I finally had achieved what I was looking for. The depth, articulation and holography I demanded from my system had been met, because of the MUTEC. The Yggdrasil had only gotten it half way there, but the MUTEC elevated it to the level which brought the performance and instruments into the listening room. The piano sounds like it is in my room as I write this and I thank you for an excellent piece of technology! 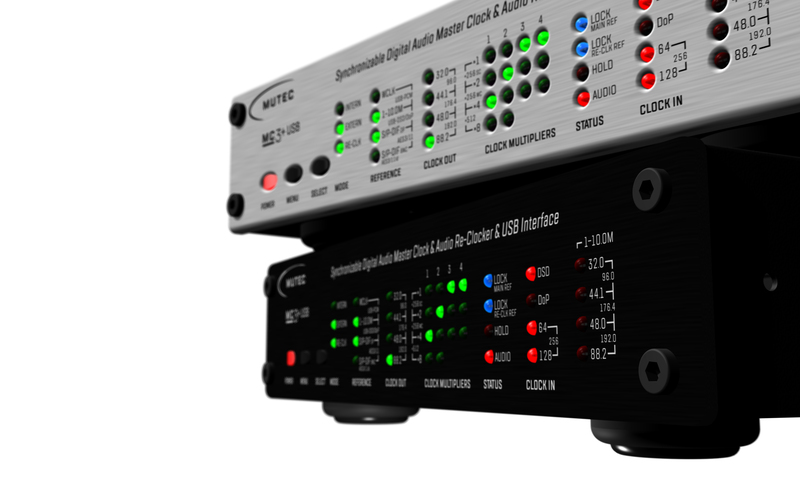 Even if I had $150k or more to upgrade my system, I absolutely would keep the MUTEC MC‑3+USB at the beginning of my audio chain, no question about it!" "I am using it with several different audio devices: Auralic Aries streamer, PS Audio digital phono stage, and a PS Audio DMP. The MUTEC then feeds a PS Audio Directstream DAC. The results are the BEST digital I have ever heard in my system. I have never heard better music reproduction in my system over the 40 years in this hobby! This tried and true description applies: "It&apos;s like cleaning a dirty window...now everything is clear, detailed, 3D"...and not at the expense of any etching etc. I am blown away! Thank you MUTEC, for a great product!" "Regardless of the D/A converter in use the MC‑3+USB consistently rendered a more complete and colorful sonic image: transients come across less aggressive, yet very fast and detailed. As a whole the playback seemed more natural, more relaxed, and with increased depth and transparency. In summary, MUTEC has created a universal tool with many benefits and exceptional sonic potential in the MC‑3+ Smart Clock USB." "Having been a strong believer in analog audio I’m now excited to experience what digital audio technology is capable of delivering with the MC‑3+USB and how many previously hidden details can be uncovered these days. This verdict is true for all digital formats. I’m definitely looking forward to be surprised again when MUTEC announces new developments in the future!" "I consider the MUTEC MC‑3+USB to be one of the big surprises of the year. The device is a true Swiss army knife for the digital signal chain thanks to its versatility. The sonic improvements particularly when using the USB connection are astonishing. This is a must try!" "The MC‑3+ Smart Clock USB is a digital Swiss Army knife with audiophile aspirations for me. At the moment, I mostly use it as a USB-to-AES interface for clients who like to bring their production laptop to the mastering session. As such the MC‑3+USB provides a convenient, highest-grade integration with my system. 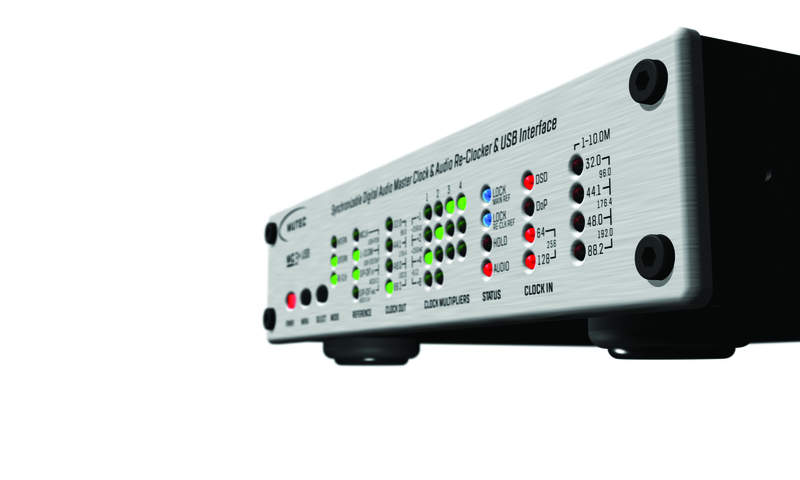 It also provides a clear sonic benefit when used as a re-clocking unit in the signal path to the D/A converter. In general, the MC‑3+USB has proven useful in a variety of applications based around clocking and syncing. What a great investment!" "The MC‑3+USB is really great! The best thing is that it’s not hard to pick out sonic differences at all. They are immediately present as soon as the device has been inserted into the signal chain. Both my Marantz NA11 and the Auralic Vega clearly sounded better with the MC‑3+USB feeding their digital inputs. I would prefer if the USB interface wouldn’t have to be manually switched between receiving PCM or DSD/DoP signals, but once this get’s taken care of in a future software update, I really have no reservations at all. This is a very well designed piece of equipment - well done!" 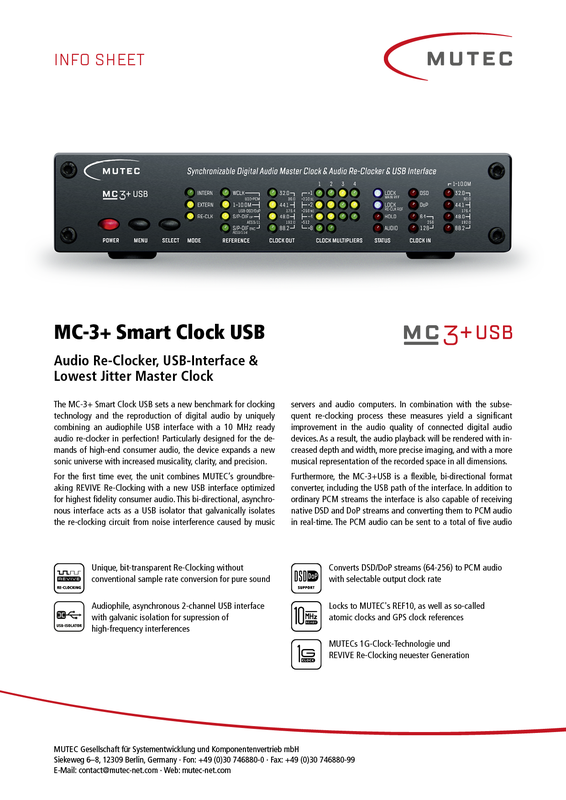 "MUTEC's MC-3+ Smart Clock USB provides four excellent clock signals and helps achieve a better overall sound in complex systems with multiple converters. The stereo imaging becomes cleaner and the bass response tightens up. Furthermore, the re-clocking feature is capable of refreshing inferior digital signals and converting them to a range of formats. Equally useful is the high-quality DSD/DoP-capable stereo audio interface that isolates the USB stream from the computer and removes interferences from the audio world. The REF 10 is also really interesting and can even improve upon the already excellent clock of the MC-3+USB"
"The MC‑3+USB is indeed very good - we've never experienced such an improvement in sound quality before. Even the best CD transports like our Mark Levinson, Fostex or the Proceed players sound significantly better when their signals are re-clocked with the MC‑3+USB, though high quality cables still yield an additional improvement. The entire music becomes more enjoyable and clearer. We've also determined that the musicality of individual music pieces we've listened to would be audibly heightened as a whole. What a great device!" "I set up the MC‑3+USB in about 5 minutes. I set it to INTERN and RE-CLK, it locked onto the incoming USB signal, and played music immediately. Right out of the box it sounds fantastic. After listening to it for a few days, I do believe that it is superior to both the Berkeley Alpha USB, which some believe is the standard, and also to the Lampizator USB Transport, which I have been using for the past year. You definitely have a winner here." "The MC‑3+USB is just so amazing! It has transformed my system to another level. The music is more involving and much more enjoyable. At the time of writing this, I am listening to the music and I just can't get the big smile off my face. Thanks again for your effort in making such a great product at an affordable price." "The MC‑3+ Smart Clock USB - delivering more music in every respect as if somebody had lifted an imaginary veil to present a bigger stage. The sonic palette becomes richer and more differentiated, transients are more precise, and the sound space gains definition and size. I also seem to have noticed an increase in dynamics. I have now unlocked the full potential of my existing devices and feel ready for the future. As a consequence, I’m definitely keeping the MC‑3+ Smart Clock USB and am excited to be one of the first to have this listening pleasure." "To sum it up: the improvements in sound quality are more significant than I would have expected. Individual voices or instruments are more focused, intricate details are more audible. Critical recordings that have been mixed with a tendency towards harsh high frequencies (e.g. Threshold: Hypothetical) benefit the most from the improvements. Strings (Tartini) loose their last remnants of brittleness. Both my wife and I agree: the MC‑3+USB is here to stay!" 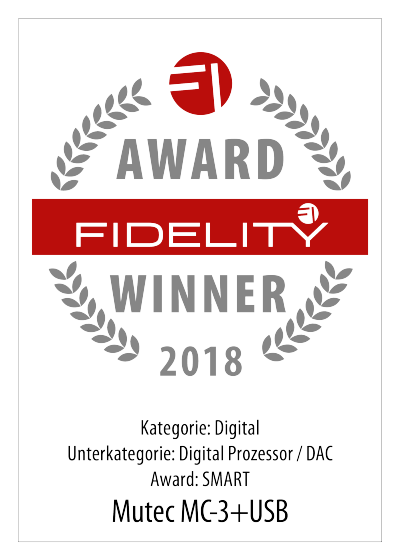 "Inserting the MC‑3+ Smart Clock USB between a laptop and the Linkwitz PowerBox 4180 significantly optimized the precision and composure of the music reproduction. The biggest improvements could be heard in piano and cymbal section. Furthermore, the already solid sound stage of the Linkwitz LXstudio speakers became more structured and outlined. 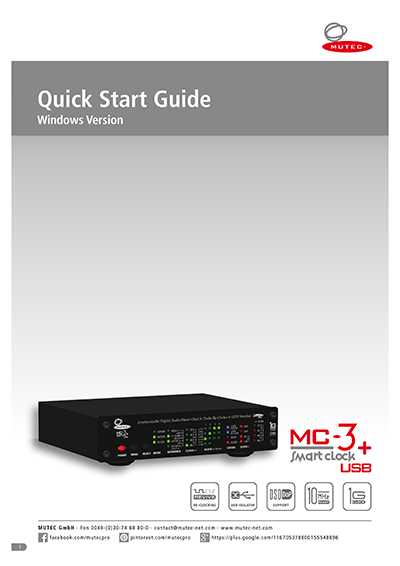 The MC‑3+USB converts stock computers into high-grade audiophile music players." "I already had the MC‑3+ Smart Clock in my signal chain and have enjoyed the benefits it has brought to my system. I had been using the Berkeley Alpha USB converter as well. But after inserting the MC‑3+ Smart Clock USB I found that I could take the Berkeley device out of my signal chain. The MC‑3+USB brought a smoother quality to the sound that I found very pleasing and continually returned to. For a very good clock, the price is fair. For a very good clock and a very good USB converter, the price is outstanding." "The problem I was trying to solve was that music streaming from the PC or sources like an Airport Express or a Sonos into the DAC were noticeably flatter and more two-dimensional compared to music coming from a Unitiserve Server or USB sticks. 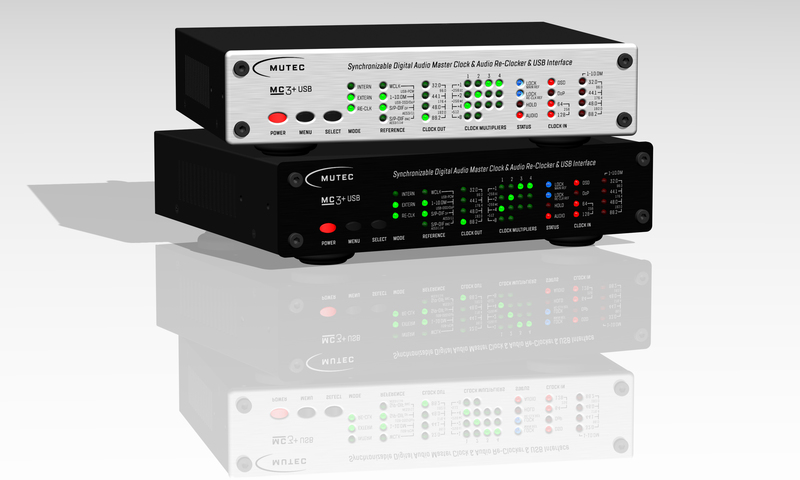 Feeding ‘inferior’ sources through the MUTEC MC‑3+USB solves this problem, bringing all sources up to the same high standard. The sound I am getting is much better - for me I get more clarity on brass instruments, more 'edge' on guitar strings - basically more clarity and detail, more realism in what was already a good set-up. I'm really pleased! And thank you very much for taking the time to follow-up on my setup questions, which I greatly appreciate and I think is the sort of customer attention that distinguishes between firms that care and those that don’t." "I couldn’t be happier with the MC‑3+USB. In conclusion, the MC‑3+USB impresses with better spatial resolution of individual instruments in comparison with an externally clocked hiFace Evo. I also feel that the bass response (upright bass or similar instruments) is cleaner and more precise. I don’t really like these expressions myself, but I can definitely spot the differences in a blind test and these things are difficult to describe. This is a great device! Congratulations!" "I’m super happy with the device. My playback system has reached a higher echelon of music reproduction and it’s pure joy to discover new facets in the music!" "It arrived yesterday - a beauty in black. Looks high quality and feels the same way to the touch. As a first step I’m using the new MUTEC MC‑3+USB as “just” a re-clocker. So my old DDC (Weiss int202) remains in the signal path in order to identify the sonic differences that the MUTEC is causing as a DDC in the second step. Immediately the music sounds better differentiated, with increased spatiality. The overall sonic character is just more beautiful - the highs are not as harsh. Listening to music is simply so much more enjoyable." "Well, we have a deal. The MUTEC MC‑3+ Smart Clock USB clearly does something to the sound. Everything get’s cleaner, more clear, transparent, wider, better soundstage. To be 100% sure I did a blind test with my partner 10 times. The results where clear: I only doubted once which resulted in the wrong answer, the other 9 times there was no discussion possible. Thank you very much for the service! This unit gave the hobby a new boost." "I’ve had the MC‑3+ Smart Clock USB for a few weeks now and I’m very excited about it. I never would have thought that computer audio could sounds so great. The MC‑3+USB truly delivers and the black front panel looks magnificent. I’m using it with a Mac Book Pro and that works flawlessly. Uncompressed music files in particular are a joy to listen to." 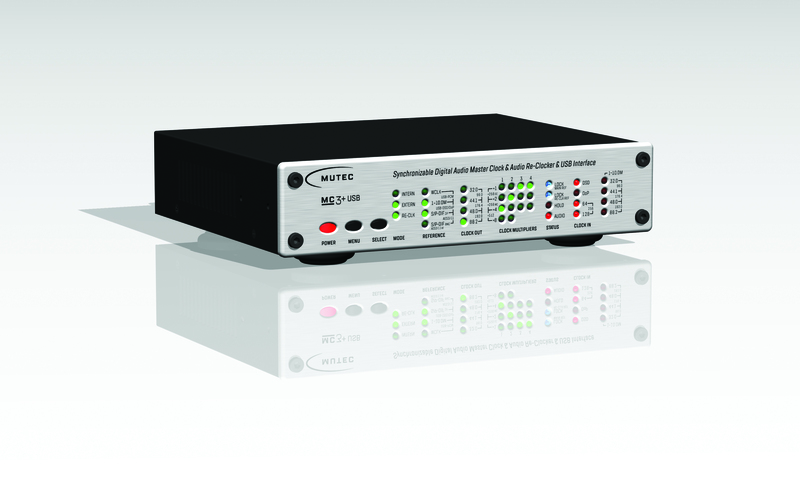 "Re-Clocking digital signals with the MC‑3+USB has let to a convincing improvement of audio quality in every respect. This was already a very positive attribute of MUTEC’s MC‑3+ Smart Clock, but the MC‑3+USB manages to top the performance. In my view, this puts it above all the competitors at an even more outstanding value for the money." "Thank you again for the simple and fast delivery. The unit plays perfectly in my listening setup consisting of a Mac Mini - Devialet 800 - Cassiano. In comparison with a direct USB connection of the Devialet to the Mac Mini, the playback via the MC‑3+USB is significantly better - particularly the spatial resolution." "The MUTEC MC‑3+ Smart Clock USB is really fantastic. It makes all of my sources sound great. Apple TV optical out sounded really good and free from jitter. It's easier to notice spacing and timing between music beats/notes. High frequency response seems even more extended. You can easily identify room reflections in a studio recording and it's easier to notice tiny reverberations in the room compared to before. Noise floor is really pitch black as it can be. In a piano recording the tail end of the piano's decay seems to decay even longer than I have notice before. Quiet passages of music seems not as quiet before, as in you hear more acoustic reverberations floating in space. When the audience claps, you hear more of the more softer clapping." "I have only just had time to incorporate my MC‑3+USB into my system, and I'm pleased to say that it is working perfectly. I have a very simple signal chain: QNAP NAS > USB > MC‑3+USB > 110 Ohm AES/EBU > Devialet 400. I'm sure you are pleased to know that the MUTEC works when connected directly to a NAS drive. And the sound is wonderful! Definition is fantastic. I can hear the smallest background sounds, the lightest tap on a cymbal, the tiniest pluck on a string, everything is now audible. Soundstage has grown in size, in fact it seems as if the music is playing in the room rather than just between the speakers. Bass definition has improved and the treble is extended and smooth. I will be connecting my CD player and Sonos system to the MC‑3+USB at some stage.I am very happy with my new equipment, my expectations have been surpassed!" 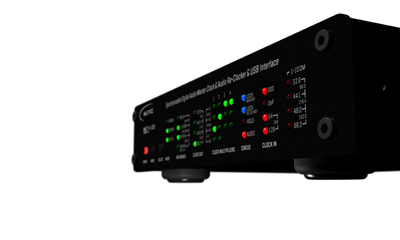 "Adding a MUTEC MC‑3+ Smart Clock USB to your music source will improve a system substantially, in fact it will enhance the sonic performance of the majority of systems and sources to a quite substantial degree. Take your standard source to new heights or your high-end source to the next level." USB digital to digital converter shootout, by Kevin O&apos;Brien, "Your Final System"